Despite its million-dollar average for a four-bedroom, two-bathroom home , Mercer Island is only No. 23. Centralia is the most afforable city for such a house. 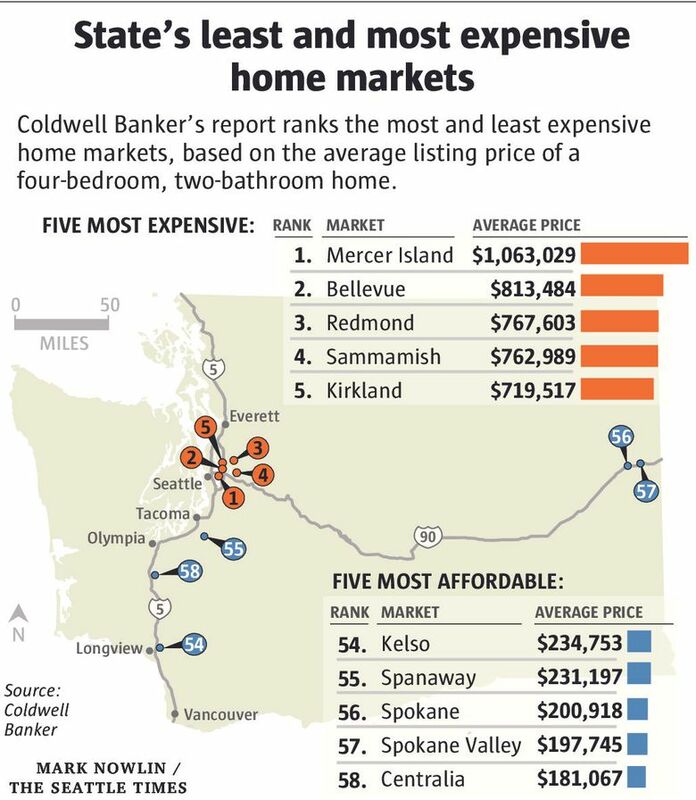 Mercer Island is Washington state’s most expensive housing market, while Centralia is the most affordable. That’s according to the Coldwell Banker Home Listing Report for 2015, which ranks some 2,700 markets across the U.S. based on the average listing price of a four-bedroom, two-bathroom home in each area. The average listing price for such a house in Washington is $404,638, placing it eighth among most expensive states. Hawaii, where the average price is $654,648, came in first. On Mercer Island, the average price for a four-bedroom, two-bath home is $1.06 million. Bellevue, Redmond, Sammamish and Kirkland rounded out the top five. The average listing price in Centralia, in comparison, is $181,067. Spokane Valley, Spokane, Spanaway and Kelso round out the five cities in the state with most affordable housing. Despite its million-dollar average, Mercer Island didn’t crack the top 20 most expensive markets in the U.S., coming in at No. 23. Cities in California dominated the most expensive housing markets, with Newport Beach No. 1 at $2.29 million. The least expensive market in the study was Cleveland, Ohio, with an average listing price of $74,502. The report uses statistical averages, as opposed to medians, “to make it useful to home buyers in the market,” according to a Coldwell Banker spokeswoman. It also removes outliers such as pricey Medina and Clyde Hill. All cities compared had to have at least 10 four-bedroom, two-bath listings.